▶ Go Best Practices — ‘Ashley’ (well, not quite, but she's happy) gave a 30 minute slide-driven talk on the practices and principles around writing code ‘like the Go team’ and how to go beyond the standard Go conventions and look like a veteran Go contributor when you code. How to Build a Serverless API with Go and AWS Lambda — AWS Lambda’s first class Go support is no longer breaking news, but this is a very thorough walkthrough of using it. 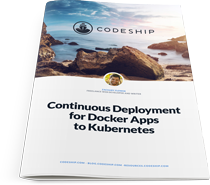 Free eBook: Continuous Deployment for Docker Apps to Kubernetes — In this book we will look at automating the management, deployment and scaling of your containerized applications and set up CI/CD to Kubernetes. Charlatan: A New Go Interface Mocking Tool — A code generation tool that automates the generation of fake implementations of interfaces for unit tests. GitHub repo. ▶ Automate Chrome with Go and the Chrome Debugging Protocol — If you’re looking for a non-headless way to automate a Chrome browser, ChromeDP makes it reasonably simple. Creating a Bitcoin Hardware Wallet with Go and a Raspberry Pi Zero — Learn how to create an offline hardware wallet for storing Bitcoin and other altcoins. Sharp-Edged Finalizers in Go — A follow-on to last week’s The Tragedy of Finalizers which demonstrates a way to use finalizers to detect resource leaks. Go Microservices Developer | All Levels | Bristol UK, relocate — Friendly team serious about tech, building in open source. Talk with us about growing skills across data, systems and scaling. Go Expert? Sign Up for Vettery — Developers with four-years experience average five or more interviews during their first week on Vettery. Encoding Data in Dubstep Drops — Some fun messing around with audio from Go here. Building A Really Smart Jabber Chatbot with Dialogflow — The tutorial uses an XMPP bot that connects to HipChat. How A Tiny Go Microservice Coded at a Hackathon Is Saving Money — Movio used a small amount of Go to replace slow SQL queries and save money on infrastructure. dqlite: Distributed SQLite for Go Applications — Uses the Raft consensus algorithm. Unlike rqlite, it supports transactions and replicates differently. Got-qt: Build Cross Platform GUI Interfaces in Go with QML — Some extra background info here. gotop: A Terminal-Based Graphical Activity Monitor — Go continues to be popular for building systems and ops tools. GoRuby: An Attempt at Implementing Ruby in Go — Experimental but progress has been ongoing. Ironclad: A Command Line Password Manager — Now at version 1.0.